HRE Explains: What is TUV? https://www.tuv.at/en/certificate-search/Over the years HRE has received numerous questions regarding TUV certification. What is it? Why is it important? What is required? Other companies are starting to claim they have TUV certification and we have received numerous questions as to whether these claims are true or false. HRE can’t determine whether others are properly going through the legitimate process of getting TUV approval or just falsely claiming TUV approval to improve their image. What we can do is clarify what is required of TUV and what you should be looking for from a company that claims to have TUV approval. 1) WHAT IS TUV? - In the case of wheels, TUV is a European auditing and certification body that ensures wheels manufactured for sale in Germany, Switzerland and Austria meet international (ECE Regulations), EC (European Community) directives, and German Motor Traffic Agency (KBA) road traffic legislation. a) Manufacturer Certification (Certification of the wheel manufacturer’s quality management system) - If you aren’t an actual manufacturer you can’t be a TUV certified manufacturer. If you’re not a real manufacturer and your supplier isn’t a TUV certified manufacturer you cannot have your wheels TUV approved. This requires that the actual manufacturing facility (in HRE’s case this is our production facility at our headquarters in Vista, CA) passes an audit every 3 years by TUV authorities from Europe. The facility must ensure the manufacture of its wheels meet the standards set by the authorities above in point 1. This is very similar to an ISO 9001 audit and designed to ensure consistent quality of manufacture. TUV wants to ensure that wheels sent to TUV for te sting are not “ringers” and that all wheels manufactured at the approved facility meet the same standards. HRE’s quality management system was originally certified in 2008 by Germany and recertified in 2011 by Austria (which is applicable for Germany). 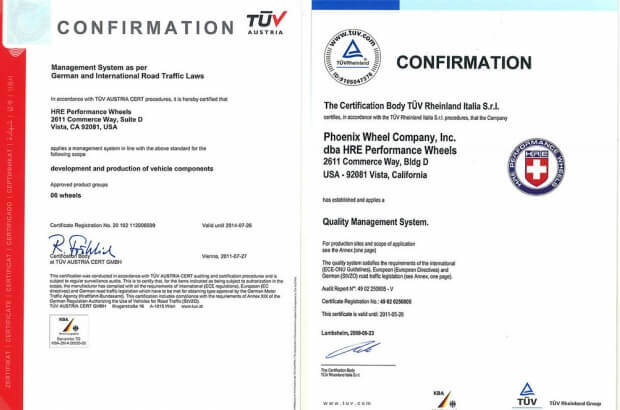 b) WHEEL TESTING CERTIFICATES (Certification of wheels as conforming to geometric standards and having passed structural fatigue and impact requirements for specific vehicle and load rating requirements) - Once a manufacturer’s facility is certified they are then able to send wheels to Europe to pass TUV geometric tolerance analysis and testing for fatigue and impact. This is not a generic style-based test, but vehicle-based with each style being tested with the proper widths and offsets and load rating for the appropriate vehicle targets. This is a very time consuming and costly endeavor for any manufacturer to TUV certify their entire wheel offering, particularly a brand like HRE that makes custom fitments and offers dozens of styles for any particular vehicle. Given this fact, HRE does not certify every style and fitment, however we do have multiple styles in several fitments tested, approved and certified for sale in Germany, Switzerland and Austria. Regardless of certification, ALL HRE wheels are designed to pass TUV structural specifications (with varying load ratings depending on vehicle targets) and are sent for certification when the demand for them in Europe meets a minimum threshold. 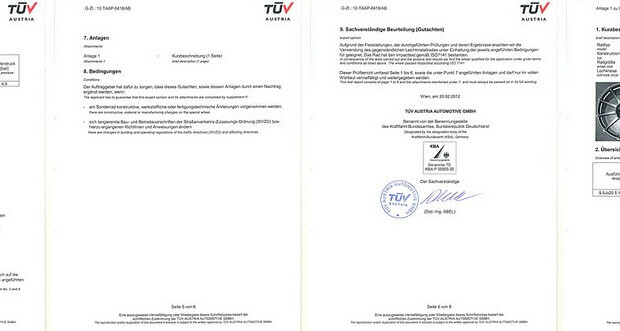 c) VEHICLE OWNER CERTIFICATION (Certificates ensuring wheels installed on an owner’s vehicle are TUV certified for that vehicle) - This is a certificate that the owner of the vehicle receives from TUV authorities showing his wheels are TUV certified so he can legally register his vehicle and pass annual inspections in Germany. The wheel manufacturer does not supply this document. 3) IS TUV FOR WHEELS ONLY? - TUV does not only cover wheels. It covers everything from toys to wheels to appliances so companies may hold TUV certificates that do not in any way allow them to legally sell wheels in Germany, Switzerland or Austria. By the same token HRE is only able to sell wheels (not toys) and only those wheels tested in Europe having passed the appropriate tests. None of this is possible without FIRST receiving the manufacturer certification. More importantly, simply by having a wheel pass a TUV test does NOT mean you are a TUV certified manufacturer. You must have a manufacturing facility to certify and that facility must pass the audit. 4) WHY DOESN'T HRE PUBLISH TUV CERTIFICATIONS? - We’ve been asked for a long time to publish TUV certificates. For many reasons HRE does not publish internal specifications and documents, but we will deviate from that decision to help clarify the confusion and show you our manufacturer certificates from 2008 and 2011 and we will show you an example of a wheel testing certificate; in this case the latest wheels sent to TUV for testing, a P43 in 20x9.5 ET42, PCD 5/114.3. The tests required 3 wheels to be tested for cornering fatigue, radial fatigue and impact at 750kg, a much higher level than the original design load rating. All passed. These tests certify the P43 style in that specific width, offset and PCD for that specific load rating. 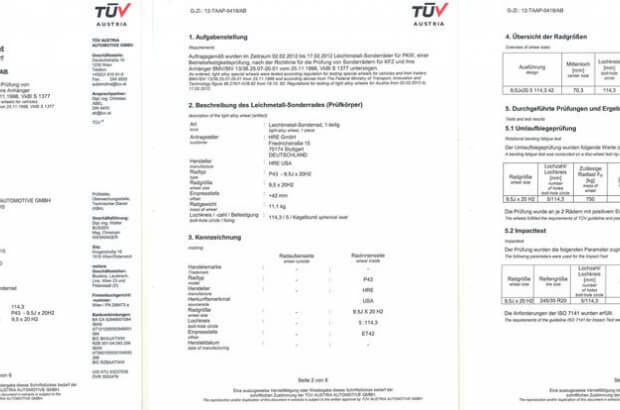 5) HOW DO I KNOW IF A COMPANY IS REALLY TUV APPROVED? - TUV obviously wants to ensure others aren’t making false claims about TUV approval. For this reason they have a simple website system to check a manufacturer’s TUV Registration ID number. HRE’s current TUV ID number is 20102112006509. This number can be confirmed as genuine by following the link below to the TUV website and entering the registration number or simply typing in HRE. Ask a manufacturer for their registration ID number and website link. They should be proud to give it to you. Click on "Certification of management systems" tab.